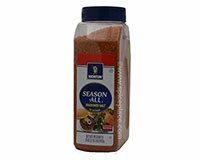 Morton Season All Seasoned Salt was formerly known as McCormick Season All. Use Morton Season All anywhere you would use salt to add additional flavor to your meals. Ingredients: Salt, Spices (including Chili Pepper, Black Pepper and Celery Seed), Onion, Paprika, Maltodextrin, Garlic, Silicon Dioxide (added to make free flowing), and Annato (color).